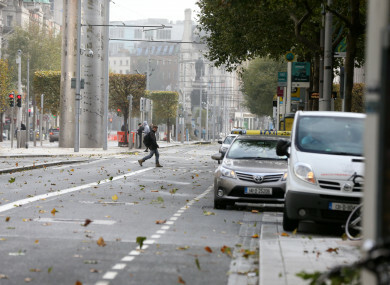 O Connell Street in Dublin as Ex-Hurricane Ophelia batters Ireland. THE TAOISEACH HAS committed to drafting guidelines to outline to businesses in the private sector what a code red alert means and how employers should deal with their employees in such a situation. Following the issuing of a nationwide red alert ahead of Storm Ophelia, there was a further announcement that all schools, creches and universities were to close. The National Emergency Co-ordination Group advised that people remain indoors and stay safe. However, there was confusion as to whether all businesses should close, and if people should go to work or remain at home. Labour leader Brendan Howlin today commended the government of their preparations and action for Storm Ophelia, however, he said lessons should be learned from the event. Howlin told the Taoiseach that there should be a clear plan as to what should be done in the case of a red alert, stating that some employers were unclear about what to do and whether to close and tell their workers to stay at home. Today, the Irish Nurses and Midwives Organisation (INMO) said it would not tolerate employers deducting pay or insisting that employees take annual leave, as a result of having to stay away from work yesterday due to ex-Hurricane Ophelia. David Hughes of the INMO said decision to declare a red weather warning was taken to save lives. It is most regrettable that health employers are now seeking to penalise nurses and midwives who adhered to the warning or could not attend their workplace yesterday because of the effects of the storm. “On Sunday night, we saw many companies unsure how to deal with their employees. Should we not have a clear understanding throughout the economy, as is the case in the education sector, of what should be done in the event of a red alert?” he asked. Foreign Affairs Minister Simon Coveney was questioned by Sean O’Rourke on RTÉ Radio One yesterday as to whether the government should have stepped in and announced a nationwide emergency, insisting that all businesses close. Instead, the matter was left to individual employers to decide upon. It was put to the minister that people who had made their way to work in the morning then found themselves with no way to get home due to all public transport services announcing that they were to cease operations for the entire day. Questions were also being asked as to whether employers had a duty to pay their employees if they chose not to go to work. Howlin called on the government to carry out a review of Storm Ophelia and how the government performed and to commit to issuing guidelines to the private sector as to what a red alert means for them and their employees. This was the first time there was a red alert nationwide, the Taoiseach told the Dáil this afternoon. “One decision was to close schools and that was made within a few hours of the national red alert issuing. A decision was made that we could not leave it up to individual school boards and so on to decide and that it had to be done on a national basis. It caused genuine confusion for some people in the private sector because it was unclear to people as to whether they were to go into work or not. “The advice that we gave people was not to do any essential travel but going to work is essential for many people. “We will have to develop a better understanding of what a red alert means beyond the public sector and what it means in the private sector,” he acknowledged. “We need to know, when events like this might occur, what specifically is expected of employers and employees in the event of a red alert affecting their area of work. A commitment by the Taoiseach to provide such guidelines would be very welcome,” said Howlin. If guidelines do not exist already, which I do not think they do, it would be a very good idea to issue guidelines as to what alerts mean in many different circumstances, particularly for private sector employment. Varadkar said they would work the new guidelines into the review of public services and government services during Storm Ophelia, which Cabinet this morning agreed to undertake. He said the issue of guidelines would be considered at the next meeting of the Office of Emergency Planning in November. This morning’s Cabinet meeting also discussed the clean up operation for Storm Ophelia, with the Minister for Housing, Planning and Local Government, Eoghan Murphy, updating the Cabinet on the national emergency co-ordination group. Email “Should employees go to work during a red weather alert? Leo agrees to issue guidelines ”. Feedback on “Should employees go to work during a red weather alert? Leo agrees to issue guidelines ”.